The most popular sizes for general use are 10x42 and 10x50, but size isn’t the only consideration. There is also eye relief and field of view. In general these two contradict each other. Increasing eye relief decreases field of view. Increasing field of view decreases eye relief. If you find one that gives you both it will probably be more expensive. My spotter is a good one and I like it. I mean, I can almost tell if a fly is male or female, LOL! What I want though, is how to attach an camera to the spotter for good pictures. There is probably a a connection screw-on, I just don't know what it is. Pocket camera with 3X optical telephoto, jammed against 8X binoculars, both hand held in an emergency situation, and shot from my boat to the shore in Alaska. This was in a situation where time was limited. And these burry ones were the most in focus out of about 20 shots. So we can cross off that option. 58 years ago, I worked in a camera shop in Chicago where they sold the gadget you are looking for. I have not seen them since. One of the salesmen speculated that the pictures would not be as clear as the sample I was looking at in the ad, which he claimed must have been faked. It was too much money to risk, as I was in high school. The adapter itself was only $10, but the scope would have been the expensive part. Today, if such a thing is still around, it's probably better. There probably is an adapter, but exactly what depends on your scope, camera and lens combination. My obligatory bear photo. 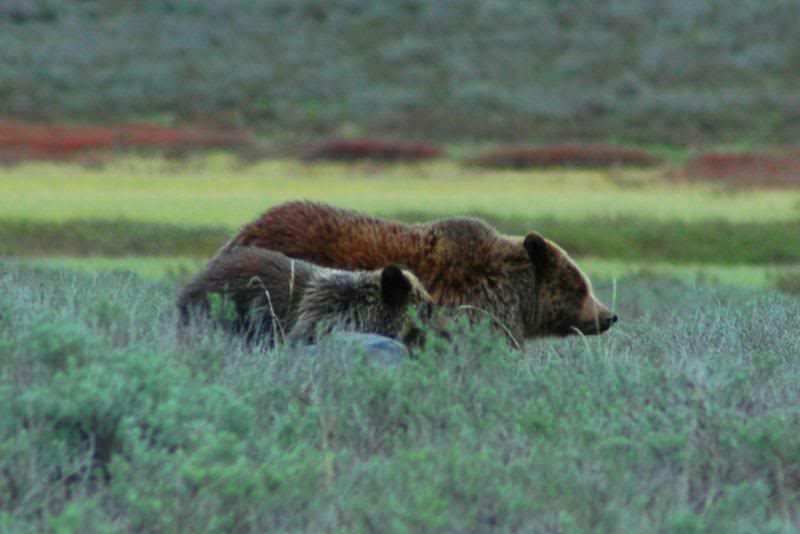 Taken in Yellowstone in 2011 fromn a long way off using a Nikon D70 with a 200 mm lens. Sorry Cavebear. I'm not sure what I did, but while trying to quote your post I somehow managed to edit it instead. I tried to fix it, but I'm not sure I got back to how it was to begin with. Good one. Did you use a tripod for that, and has it been cropped? The black phase grizzly is very interesting. I've never seen one of those. No tripod. Yes it was cropped. Curious. Do you object to adjusting pictures for lighting and definition? No. I do it all the time. At least for lighting. Not so much definition. I know this wasn't to me, but why not adjust for anything you want? Digital recreations in photographs are approximations of color and lighting to begin with. In a normal photo, they are close enough to the true colors so that people don't notice anything odd, but read a technical review of a specific camera at a site like You are not allowed to view links. Register or Login, as opposed to Walmart or Amazon, and you will find 5 page reviews with a section that includes an analysis of color and definition across the whole field of view. No camera or photo creates a perfect reproduction. This was true of film also. Kodak Kodachrome was probably the most popular 35mm slide film in its day, but was also criticized for exaggerating the warmer colors. Ectachrome was a much faster film, and both films were often used by National Geographic photographers. But Ectachrome to my eye, suffered from a washed out look. Some believe the colors were actually more accurate, but they were still not exact, and I threw out a lot of Ectachrome slides because looking at them tended to bore me. Today when cropping my photos, I tweak stuff all the time, I usually add a bit of blue and/or green to scenery to bring out the sky and the trees. And I've noticed a current trend for some noted photographers to intensify the colors to such an extreme that it creates a surreal quality. Hollywood did this in the second Guardians of the Galaxy, where the opening scene of the couple driving through the countryside looks so colorful as to be a bit unearthly. Later, Ego's planet and bejeweled castle are given the same treatment. I haven't had much luck trying to give a blurry photo more definition or making an overexposed shot less washed out. You have to have a reasonably good picture to start with. I like to change all my bird and cat blog pictures to high definition. It really shows on the small blog space. What I want though, is how to attach an camera to the spotter for good pictures. That is an age old question and yes there are answers. People have wanted to take photographs of what they see in their astronomy telescope for a long time. Most camera attachment either replace or screw onto the eyepiece of the telescope. Finding these things in a neighborhood store is a difficult task. Internet search is much easier. Either you start searching telescope stores and parts, or you start searching camera stores and parts. If you have money the high end is a CCD camera. It doesnt have a lense because it is expected to be attached to a telescope. If you have a machine shop and you know how to use it you can make your own attachment. If you dont want to mess with the hassle, there are a lot of camera attachments already made. It depends on what telescope you have and what camera. I think I will check Amazon. I want a ready-to-use thing.